Within minutes of Recode.net putting up this photo gallery yesterday, which includes prices of some of the consoles, I began hearing the nails driving in to the coffin of Steam’s “Steam Box.” Reasons vary from the painfully obvious, to the semi-subtle… but alarm bells should have been going off at Valve a long time ago, letting them know that this was going to be a terrible idea. Engadget has a complete lineup of consoles from various vendors. And while they look interesting, they are going to suffer. I cannot believe Valve got so many vendors to bite on this idea. They are essentially just building out small-form-factor PCs, but the form factors are so widely varied that it feels like we might be beginning to lose the standardization of PCs; that which made the PC so great. Here is why I feel completely safe calling the Steam Box “console” a failure, even before it launches. Video game consoles are meant to be standardized. Going into a store and paying one price, gives you one option. Sure, you may be able to select a bigger hard drive, but when it comes to in-game performance, nobody gets an edge. Video game consoles are less expensive. Some of these Steam boxes showed pocket book draining $2,000+ price tags. Unless these things dual boot Windows 8.1 and Steam OS out of the box, that price tag cannot be justified. If I’m paying that much money, I want a full-blown PC, not a fancy looking gaming console. Although this would be easy, offering a dualboot option might confuse consumers. Video game consoles are typically sold at a loss. Sony is losing money on every PS4 they sell. In time they will break even, and as parts prices fall, eventually they can turn a profit. But right now, they maintain profitability by offering services like PlayStation Plus, the PlayStation Network, and by selling and licensing games. Sony has their own studios to make games for their console, and they take a cut of everything sold in the PlayStation Network Store. Profits come from attachment rates, not from the sales of consoles themselves. In order for someone like “Alienware” to turn a profit, they have to raise the price of the console. They can’t afford to sell it at a loss, because there is no attachment rate for them – Valve/Steam gets the money once the end-user has the console in their hands! Dat controller. Did they play test this thing at all? Since the Nintendo Entertainment System, the D-Pad has been on the left, the buttons have been on the right. Modern FPS games allow you to run and gun because your left thumb is keeping you moving at all times. 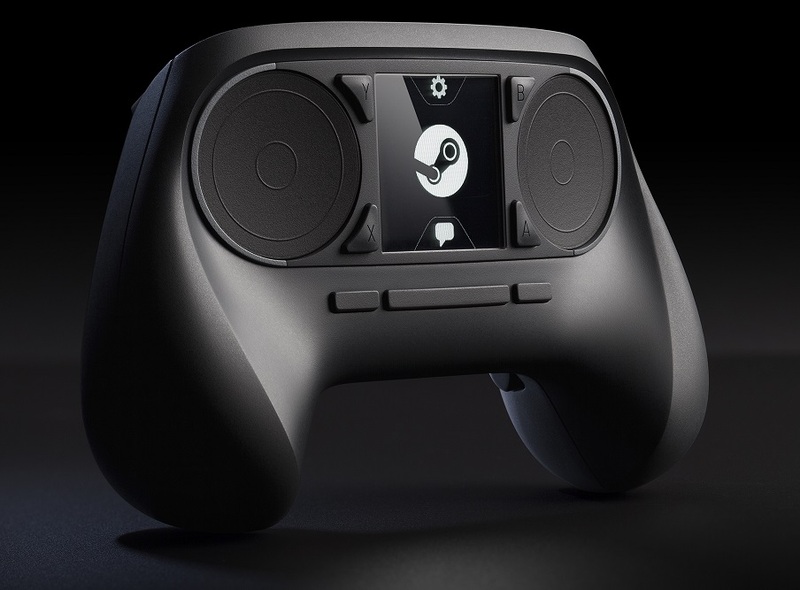 Steam’s controller places the “X” and “Y” buttons on the left side of the controller. I’m going to have to interrupt my motion in order to pick up items, etc… this just looks clunky. And have these guys EVER tried to play games on a Touch Screen? I’m glad RockStar is trying, but Max Payne and Grand Theft Auto games on my iPad were unplayable; I wish I had never wasted the money! Touch sensitive pads on my controller just don’t seem like they are going to give me enough feedback, but there could be some haptic techniques that one would need to experience in order to judge this properly. I like the placement of buttons at the bottom of the back of the controller, I have often thought that my ring finger or pinky could be doing more work – but the controller itself appears too big. I have nothing to compare it to for scale here, but remember the Xbox Duke controller? How’d that work out? Upgradability. Some of these are PC-like enough that you can swap out your graphics card, or add more RAM. Some of these are in such tiny, custom cases that you are stuck with what you buy. Too many choices. I liked the Xbox 360 because I could walk in and grab one. With the Steam box, the specs vary so widely that you will not get a consistent experience. It’s bad enough that the rich kid will get the competitive edge and better graphics, but it will simply make shopping for a console a nightmare. Steam will have to set up their own stores inside of Targets and Best Buys across the country to explain the differences to shoppers (see: parents). If tablets are the death knell of PCs, Steam OS isn’t helping the PC market. I will probably tinker with the OS on my home computer, and I even may be building a stronger gaming PC this year, but it will not solely be a Steam Box, and certainly not an overpriced, or underpowered pre-fab like any of these. And I am far from alone on that. Sorry for the spam, everyone!